Let’s continue on our topic of capital consumption. It’s an important area of study, as our system of central bank socialism imposes many incentives to consume and destroy capital. As capital is the leverage that increases the productivity of human effort, it is vital that we understand what’s happening. We do not work harder today, than they worked 200 years ago, or in the ancient world. Yet we produce so much more, that obesity is a disease more of the poor than the rich. Destruction of capital will cause us to produce less, and that will mean reverting to a lower quality of life. Let’s start off by addressing how not to look at this destruction. There is a facile belief offered by both Fed propagandists and Fed critics alike. It goes like this. Increased quantity of dollars causes increased prices. Therefore it’s like a tax. And the way to measure your wealth is divide the liquidation value of your portfolio by the consumer price index. This tells you if your stocks, bonds, real estate, and the family farm could trade for more groceries and cars this year. Or less. In this view, you are hoping that somehow your assets keep up with inflation. We insert the word somehow, because it is a kind of magical thinking. Everyone knows that a central bank cannot print wealth. If it could, Zimbabwe would be the richest country. Yet, if asset prices go up due to central bank policies, most asset owners feel richer. At least if consumer prices do not go up proportionally. One corollary of the fallacy of the Quantity Theory of Money is the fallacy of using consumer prices as the measure of economic value. Why do we say this is not the method of looking at capital destruction? It’s because over the last 10 years, the Fed and other central banks have overstimulated capital destruction. And yet the above metric of the purchasing power of your estate has gone up. Everyone (at least those who own substantial assets) feels richer, despite economy-wide impoverishment. If you were a doctor, and your deathly ill patient had a body temperature of 98.6F (37C), you would have to find another measurement tool. Clearly not all diseases cause a fever. Well, monetary doctors need to look past consumer price indices, inflation so called, and purchasing power of your assets. Our first observation is that the purpose of a capital asset is not for spending. The prudent investor does not think about spending his savings, or selling the family farm. He says “I cannot afford that $300,000 Ferrari” if he has only a million or two in the bank. This is not a new idea, by the way. It was understood by people two thousand years ago when Jesus told the parable of the Prodigal Son. If anything, it’s in danger of being forgotten by the so called economists of central bank socialism and the nouveau-riche. We had the experience not too long ago, of arguing with a man who sells whole life insurance and other long-term financial planning products for a living. He brazenly declared that there’s nothing wrong with spending your savings in retirement(!) It’s like a Stockholm Syndrome for hostages of central bank socialism. One reason why this is so hard to see is that price and yield are strict mathematical inverses, like a see saw. If you tell people that Keynes said to commit “euthanasia of the rentier”—i.e. kill the saver—everyone understands the malevolence of this. But if you say “long-term bull market”, most people think this is a good thing. Including asset owners and defenders of free markets. These are the same thing! Please pause a moment and think about this. If you take away nothing else from all of our discussions of gold and economics but this one point, it will still have been worth your effort (and ours). Falling interest and yield is the same thing as rising asset prices and endless bull markets. Now, does that help you appreciate the genius part of Kenes’ evil genius? He did not propose hanging capitalists as some of his ideological brethren. Hanging is violent, messy, and those pesky capitalists fight back. No, he proposed a drug-poison. It causes euphoria while it destroys the vital organs. Its victims die with a smile on their sunken faces. To escape your kidnappers, you must get away from liquidation value. Goethe said that “none are more hopelessly enslaved than those who falsely believe they are free.” We add that none are more hopelessly doomed to consume their capital than those who falsely accept the purchasing power paradigm. Let’s look at a simpler example, without money at first. Consider farmland. What do you want to know if you are considering working a bit of land? How many bushels of wheat it grows. Suppose one plot of land grows 10 bushels of wheat per acre. Another grows 20 (due to better drainage on the other side of a hill). Clearly the latter is better farmland, and you would choose that parcel as your effort would produce twice as much food. Now let’s say that the soil is slowly depleting, due to growing the same crop without rotation or fertilizer. Next year, the land produces 19 bushels per acre. The year after it grows 18, and so on. It should be clear to the farmer’s 8-year old son that there is a problem, much less any adult in the room. A falling crop yield is a serious threat to one’s survival, if one is a farmer. The metric for farmland is bushels/acre. It is a measure of food per unit of land. Let’s generalize it a bit, and say it is a measure of product per unit of capital. If one farmer or entrepreneur is getting less and less product per unit of capital, then he is headed towards bankruptcy. If our whole economy is producing less and less product per unit of capital, then our economy is headed towards collapse. Note that this principle is true regardless of the cost of labor and raw materials such as seed, and regardless of the price per bushel of wheat. Something is being lost, even if revenues are greater than expenses. What’s being lost is the productivity of capital itself. In our modern civilization, we understand the factors to make land produce more wheat. Land today (in developed economies) produces much more than it did even in the 1960’s, much less ancient times. We have no problem with crop yield of bushels per acre. Our problem lies elsewhere. Of course, in a modern economy, land is not the only form of capital, or even the most important. Therefore, we do not measure capital in acres. We measure it in units of what we believe to be money, the dollar. Our problem is not a falling rate of bushels per acre. Yield, in our modern economy, must be measured as production in terms of dollars divided by capital also in terms of dollars. It is dollars of profit per dollar of capital. This generalization is a bit harder to see than the crop yield example, for two reasons. One, dollar is a very nebulous concept. Just try to define it! Two, we measure both revenues and capital in dollars. It takes a bit to get your head around dollars per dollar. If you buy a farm for $1,000,000 of course you care how many bushels it produces per acre. Farming, like every industry, has its metrics and benchmarks. If the number is too low, you will have a hard time making a profit. However, the essential metric for the investor is: how many dollars will my investment generate? What is the yield? A simple example of this may help. You buy a 40-acre for $1,000,000 and it generates $100,000 in profit. That is a 10% yield. Next year, you pay $2,000,000 for another 40-acre farm. It, too, generates $100,000 in profit. However, this is only a 5% yield. The following year, you buy another one for $4,000,000 and it generates the same $100,000. This one earns 2.5%. The problem is not that the crop yield is being depleted out of the soil. The dollar yield is being drained out of the dollar. To understand abstract ideas, one needs clear concepts. Keith has proposed a new economics concept: Yield Purchasing Power. It is a measure, not of the liquidation value of your wealth, but of the productivity value. Not how many groceries you can trade your farm for, but how much food you can grow on it. Or, in modern terms, how much your capital generates. It’s been falling for a long time. In fact, it is going parabolic. To make this easier to see, we are showing it inverted. So instead of dollars of yield per dollar of capital, it is dollars of capital to buy a dollar of yield (remember what we said above, that yield and asset price are inverses). This dangerous trend begins right around the time when the mainstream view thinks that Fed Chairman Volcker had beat inflation. So let’s look at this chart again, overlaid by the consumer price index. We indexed both data series to 100 as at January 1982 and used a log scale, as Yield Purchasing Power grows so much faster than CPI. 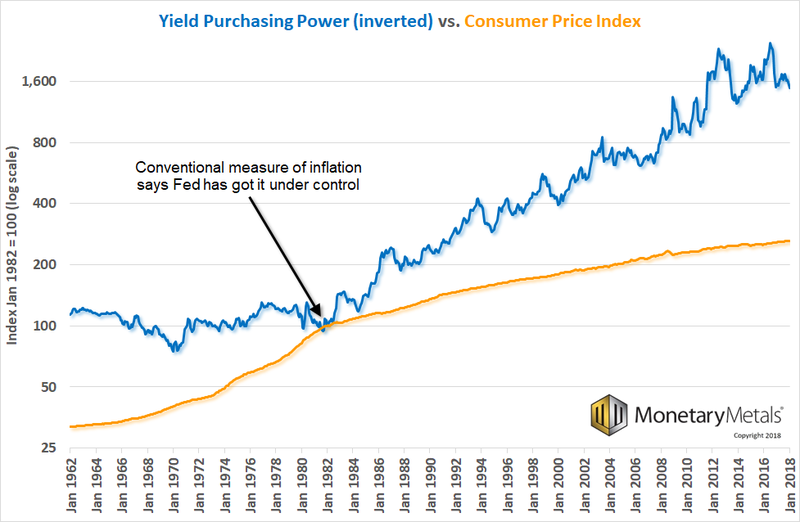 Notice how CPI is concave-up from 1962 through around 1982, and then it turns over and becomes concave-down. Concave up means it’s rising faster and faster, which certainly describes the 1970’s. And now it’s rising slower and slower (notwithstanding the gold bugs pounding their fists on the table screaming about quantity of dollars à prices). Also notice that on a log chart, YPP has linear growth. This means that Keynes is succeeding beyond his wildest dreams. Savers are choking to death, though asset owners are enjoying the euphoria that comes with their euthanasia. Now let’s tie this back to our theme of capital destruction. If capital is being consumed, squandered, dissipated, and destroyed, what would you expect? It would become scarcer. What does economics 101 teach us about the price of something that is becoming scarcer and scarcer? It rises. That is the proof of our contention that capital is being destroyed. My friends, THIS is why we need to move to the unadulterated gold standard. The gold standard does not provide the perverse incentives to destroy capital. It has a stable interest rate, and hence stable asset prices. One nearly-famous gold salesman blasted subscribers this week with, “Gold Is Going to Go Ballistic!” A numerologist shouted out the number $10,000. At the county faire this weekend, we ran out of pocket change, so we did not have a chance to see the Tarot Card reader to get a confirmation. Even if you think that the price of gold is going to go a lot higher (which we do, by the way—but to lean on Aragorn again, today is not that day) this rubbish should bother you. At the least, one should be critical of arguments that agree with you. One should look for the errors in one’s logic. And there’s something bigger, and a bit ironic. Let us explain. These shouts and touts do not offer sober or serious analysis. At best, they offer confirmation bias. At worst, they are self-serving self-promotion. The irony is that the price of gold will not go anywhere near $10,000 until the mainstream public is buying gold. However, irresponsible promotions put a tarnish on gold. Most mainstream investors regard gold as somewhat of a scam (we have heard this directly from billionaires and wage-earners). We, the gold industry, should abide by reasonable standards for responsible advertising and analysis. The price of gold dropped six bucks, and that of silver four cents. Next, this is a graph of the gold price measured in silver, otherwise known as the gold to silver ratio (see here for an explanation of bid and offer prices for the ratio). The ratio fell slightly. There is certainly no sign of the kind of supply-demand imbalance that would predict a price move of $600 to get back near the high of 2011, much less a move of $8600. We note that the April cobasis is -0.56%—nowhere near backwardation. The Monetary Metals Gold Fundamental Price slipped $6 this week, to $1,381. Now let’s look at silver. The Monetary Metals Silver Fundamental Price rose 9 cents to $17.21.